Nope. This isn’t the Elegant Trogon. But isn’t he beautiful? A year ago, Pedro and I spent time in the Chiricahua Mountains looking for an Elegant Trogon—a rare and beautiful bird (ok, I looked for the bird, he enjoyed the scenery and the mountain biking). We (I) didn’t find it—despite repeated attempts and long hikes. 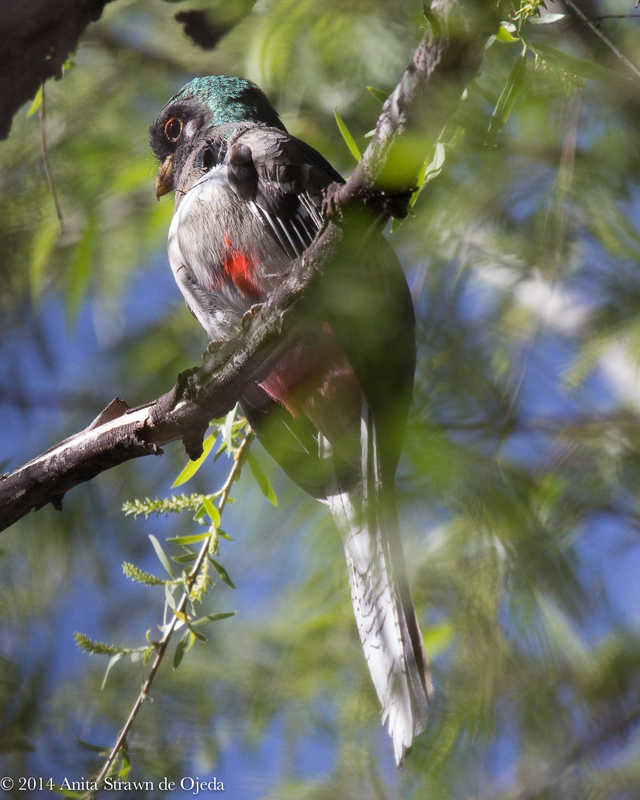 This year, we went to Patagonia (Arizona, not Argentina) in search of the same bird (ok, not the same bird) because I’d received reports that an Elegant Trogon (or two) had been hanging around Patagonia Lake State Park (don’t ask—I may be on list serves for bird sightings in Arizona…and other states). Why would anyone drive hundreds of miles just to see a bird? Have you seen the movie The Big Year? Well, I’m not those people (I claim), but I sure love photographing unusual and beautiful birds. Pedro goes along with me so that he can photograph me looking like those people in the movie (so far, I’ve eluded him or managed to close my mouth and wipe the vacuous look off my face before he can snap ‘the picture’). 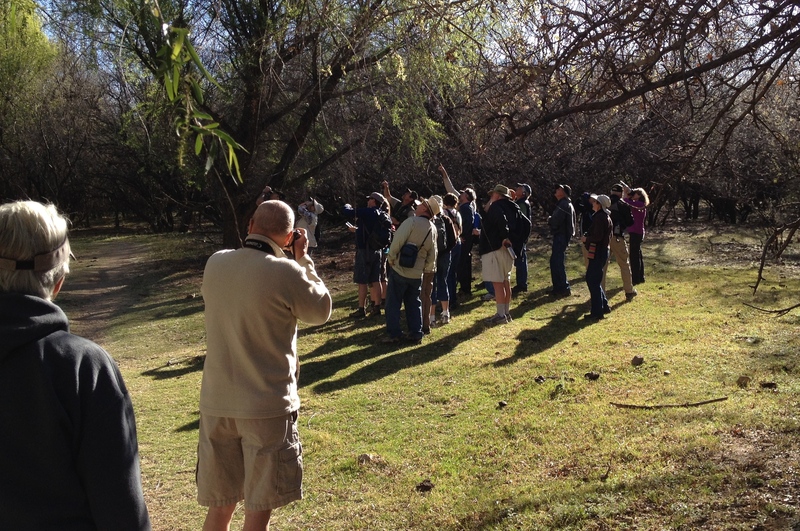 Pedro snags a photo of my mom watching my dad take a photo of birders–I’m the Ms. Frizzle-looking youngish one. I crawled out of my not-so-warm sleeping bag just as soon as the sky hinted at sunrise the next morning. I figured that walking the dog would warm me up. Which it did. A little. Then I grabbed some breakfast, found my camera gear and commenced my hunt for the Elegant Trogon. I’d left my bear spray at home, so I was a little freaked out about wandering around in the early dawn all alone. I soon discovered that pretty much everyone out that early was over seventy and looking for the same bird I sought (ok, I carry the bear spray for any animals that might attack me….). I did have a pocketknife and my camera, which I could (reluctantly) use for a weapon (I’ve seen enough MacGyver episodes to know how little it takes to get out of any imaginable situation). After almost two hours of searching for the elusive bird, I was a little grumpy—after all, others had seen it earlier that morning. How hard can it be to find a big bird in a small forest? And then Pedro texted me, wanting to know what the arrangements for breakfast were and when I would be back at camp. For some reason, this made me even grumpier. But, I texted back and told him I’d be out awhile longer and that my parents were fixing breakfast in the comfort of their RV. The liquid notes of a Song Sparrow caught my attention, and I could hear a hummingbird diving and chattering nearby. I had a lot to be thankful for (being able to hear the high-pitched sounds of hummingbirds means I haven’t arrived at that certain age when one needs a hearing aid—even though I need bifocals to read my text messages). 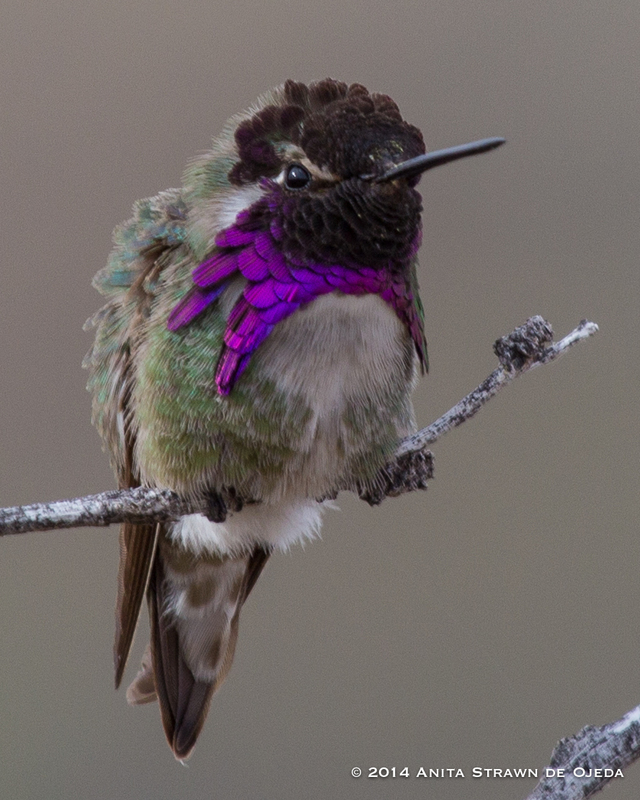 The sun had warmed the day up, and I had found plenty of other birds to photograph—including some stunning hummingbirds and a cheery cardinal. 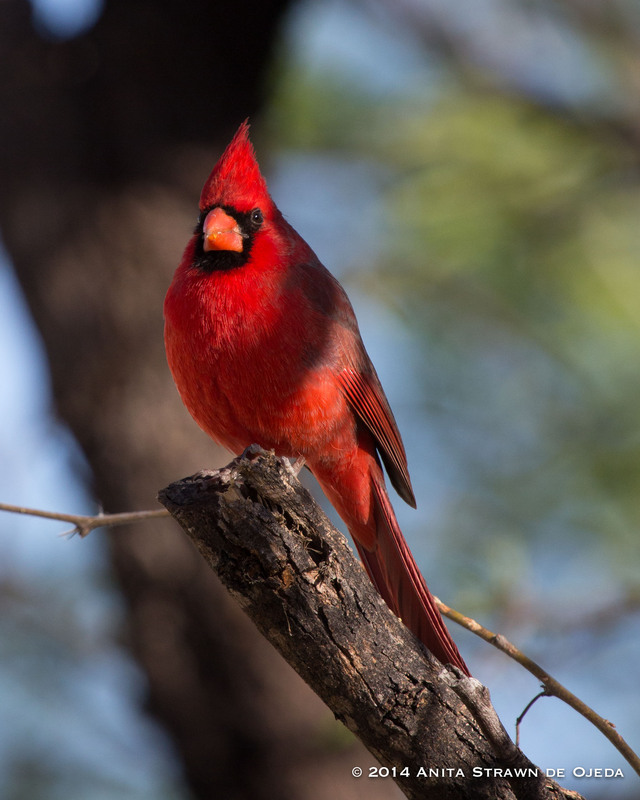 Who can be grumpy when gazing at this gorgeous bird? I stopped focusing on my failure at finding the target bird, and started focusing on all I had to be thankful for—health, a wonderful husband (who looks like the picture of health—nothing like he did eleven years ago at this time of year), two sweet daughters, a caring son-in-law, my awesome parents, and a wonderful job. I decided to go just a little further up the trail (far past the area where other birders had seen the Trogon). I meandered along an equally meandering stream for fifteen minutes and finally headed back towards camp—content with my morning’s finds (even if they didn’t include the elusive bird) because I had so much to be thankful for. The elusive bird, an immature male Elegant Trogon, seems a little camera shy. When three hikers approached me from the other direction, I looked up, and there it was! The bird I had focused so hard on finding was hanging out on a branch right over the trail I had just wandered up not ten minutes earlier. One of them turned around and casually glanced in the direction I pointed. The others sort of shrugged at the crazy bird lady (that would be me—think Ms. Frizzle with bed head and a huge camera slung around her neck) and continued on their hike. I spent four or five minutes trying to get a clear shot of the bird. I climbed up a little hill, and when I turned around, the Trogon had silently disappeared. Lesson learned. Focusing on one thing for too long won’t always get you the results that you desire—it might even leave you feeling grumpy and dissatisfied for no good reason. Focusing on your blessings will almost certainly make you feel peaceful and content. And, you might discover what you were looking for in the first place. This week I’m linking up with Kristen Oliphant and other wordsmiths for Not So (Small) Stories. Our prompt this week is ‘personal’.